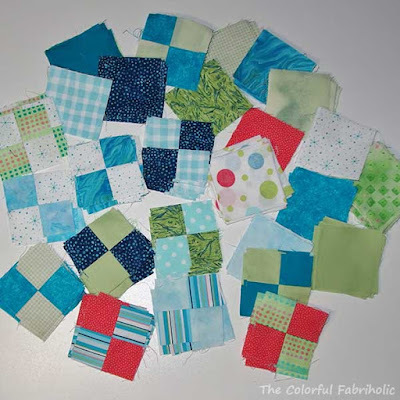 I just love how quilty inspiration and friends lead to something fun. Earlier this month my friend Cherie (Quilted Jonquil) published this post which included an antique top we saw in a shop in Paducah. I drafted the block in EQ7 for her. Friend Kevin the Quilter liked the block too, and invited Cherie, Dar (Dar's Patchwork Garden) and me to a sew day at his Quilt Cave. 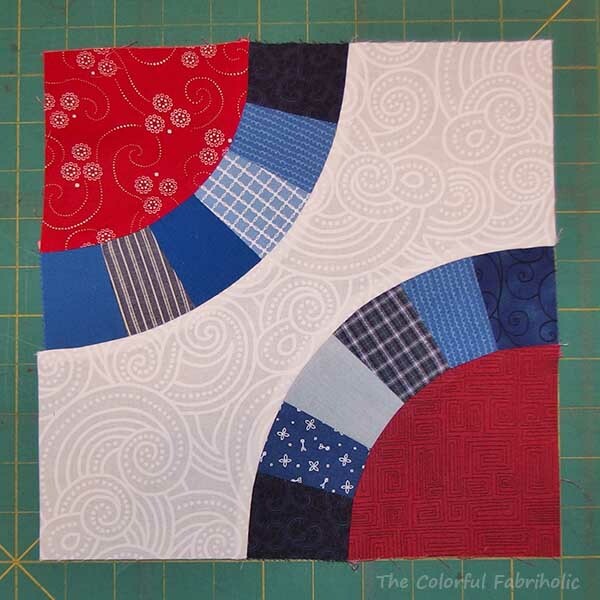 The plan is to make this block in patriotic colors for a future Quilt of Valor. Since this block requires templates and paper piecing, I thought it would be wise to make a test block before we get together. 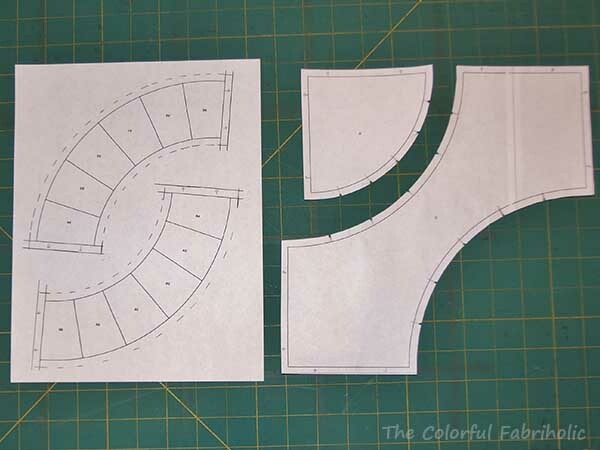 I made templates and printed arcs for paper piecing. 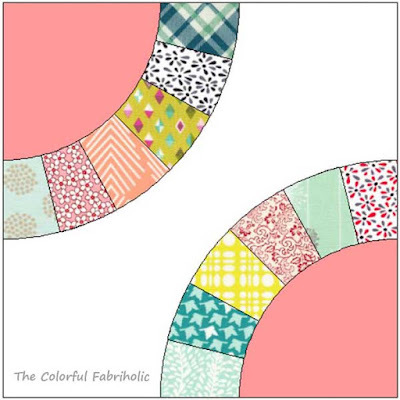 I'll bring the templates and several blocks worth of paper piecing arcs to our sew day. Kevin, Cherie, Dar and I are gathering our patriotic scraps and white background fabrics and we'll get together on Friday. I'm looking forward to a fun day! This is turning out to be much bigger than one antique top in a shop window inspiring one person. At the end of it all, four of us will have the pleasure of getting together and making something none of us may have tried on our own, stretching our skills. And the result will be a quilt for a good cause. I realized this week that I'm having trouble with my Pat Sloan Solstice Challenge blocks because I need a suitable pale background that can unify several of the blocks. A visit to local quilt shops ensued. I found exactly what's needed, and with no guilt and no regrets, I bought all that was on the bolt, 2-3/4 yards. 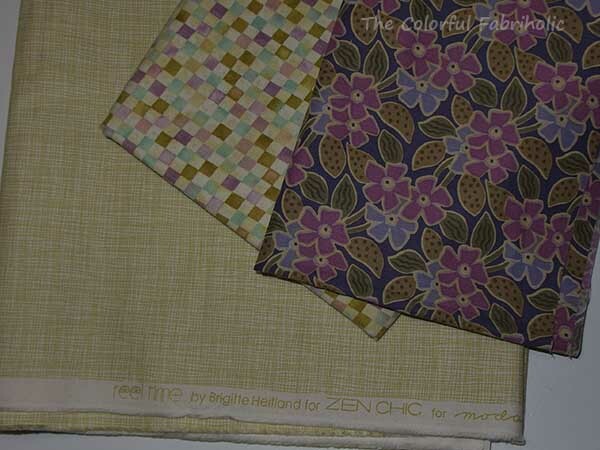 Here is the pale background, a light celadon crosshatch by Zen Chic for Moda, shown with a couple of the older stash fabrics I'm using for these blocks. It's hard to find pale backgrounds with a tint of color. There are plenty of neutrals, but sometimes a project needs a color instead of a neutral, and really pale tints are hard to find. I've resorted to using the back side of printed fabrics in the past, if the print showed through evenly enough. 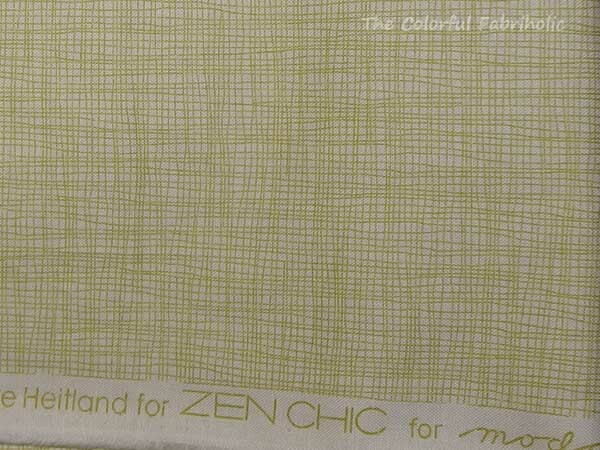 I'm glad I found this crosshatch print, which has a light yellow-green lines printed on white, with enough white in it to make it read lighter. This is perfect, and I'm sure it will be used in several of the blocks. We're in week six of 25, so there are plenty more to go, and I plan to remake blocks one and two using this new background. I'll tally up the totals at the end of the month. I've had some finishes and I'm well in the black, so no guilt. Whoo-hoo! It's such a good feeling to have the sewing room all cleaned up. My house is generally cluttered and I'm the first to admit I'm not much of a housekeeper. But I find it hard to work in my sewing room when the space is cluttered and disorganized and stuff from previous projects is piled up everywhere. So not inspiring when it's like that. I didn't take any "before" photos, but here are a couple of photos after the big clean-up. Now I can regroup and figure out what to work on next. Above: view from the doorway. The baskets on the closet shelves hold my fabric stash. Below: view from the corner near the closet doors looking back toward the sewing machine. Ah, not stressful now. I can find everything I need, and I can work in there without having to move piles of stuff out of the way. 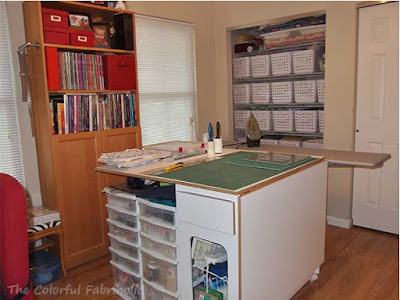 Since a clean sewing room is whoop-worthy, I'm linking up with Sarah at Confessions of a Fabric Addict for Whoop Whoop Friday. Check out what everyone else is celebrating over there. Um... This isn't going to work for me. 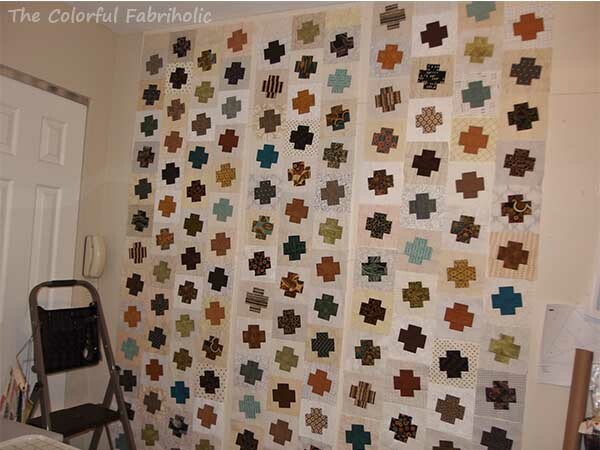 One, I'm not into applique, although I could manage a small amount like this if I really wanted to. Two, the whole basket concept is just too cutesy for my taste. Three, it looks old fashioned, and I prefer a look that is more timeless. The way I see it, the Challenge here is to keep up with making blocks every week. I've further challenged myself to work with a non-favorite color, purple. I'm also challenging myself to make small companion blocks each week featuring the fabrics of my main block. So for week 5, I changed up the basic block design by omitting the basket applique and using a feature print for the center square instead. I used strong contrast for the surrounding triangles, and subtle contrast for the corner ones. I eliminated a few seams by using flying geese instead of half square triangles. Here's how my block #5 and its companions ended up. Here are the first four blocks. I'm not loving weeks one and two so I might remake them later, but we'll see how the rest of the blocks go, first. Meanwhile, since finishing my DP II flimsy, I need to regroup, clean up the sewing room, and figure out where I'm at with several WIPs and UFOs. That should keep me busy this week! What are you working on? Since I finished my Dancing Plus II flimsy this week, I get to count the yardage used. A tight estimate is 9-3/4 yards out. No yardage in. I'll post the totals for January at the end of the month. DP II has at least 57 different dark fabrics and 52 different light fabrics. I tried to remember to count each time I cut into a different fabric, but I may have forgotten a time or two. Here's how I calculated the yardage used for this quilt (too many fabrics were used to get a reliable yardage estimate from EQ). If you're not interested, just skip all this. 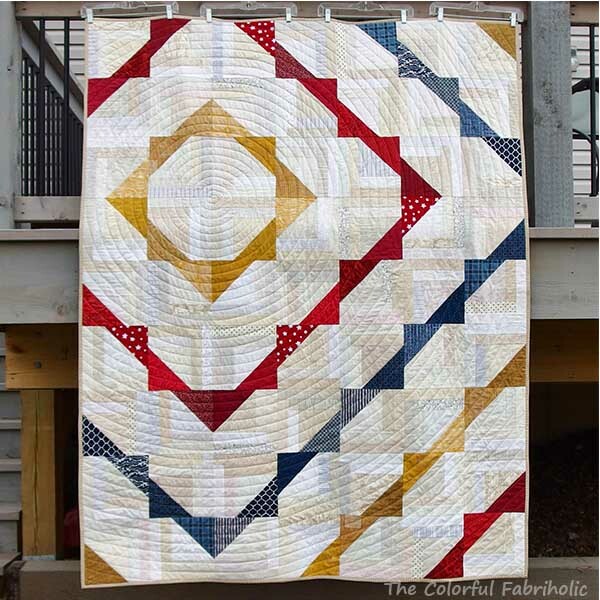 There are 143 blocks in this quilt plus light pieces at the end of each column to accommodate the half-drop layout. 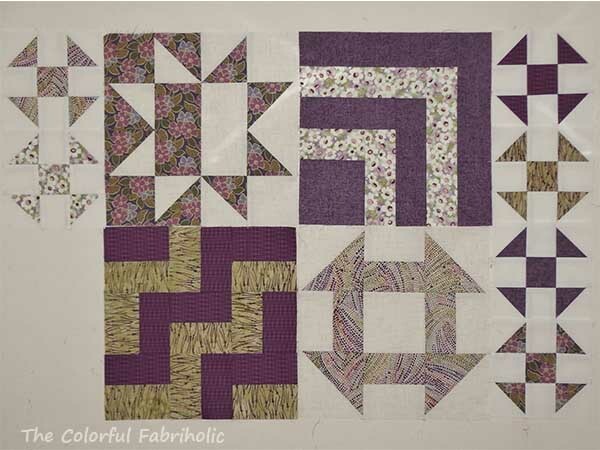 Blocks were originally made oversized and trimmed down to get the tilted or dancing effect. 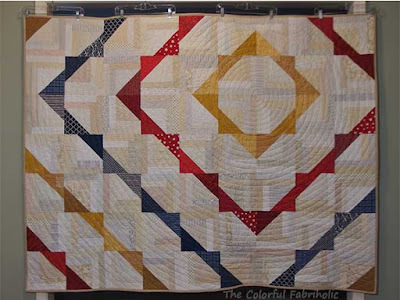 The oversized blocks required 3" cut pieces of light background. For the totals, odd fractions of yardage are rounded up to the next 1/4 yard. 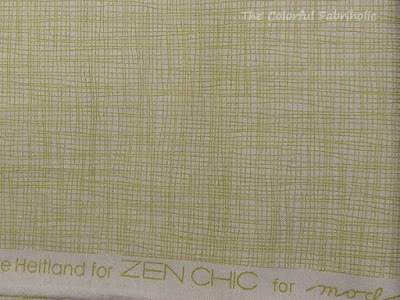 Add 10% for straightening cut edges of fabric, etc. 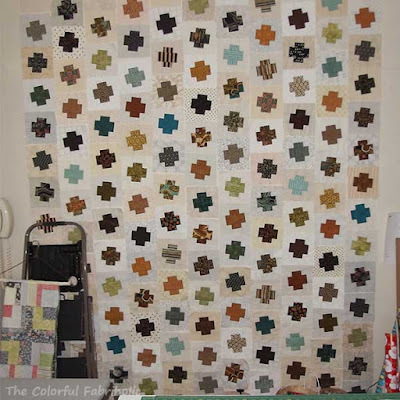 Finally, the Dancing Plus blocks and columns are sewn together into a finished flimsy. (Now I can use my design wall for other projects!) At 11 columns by 13-1/2 rows, DP II measures 66 x 81" for a generous sofa quilt. 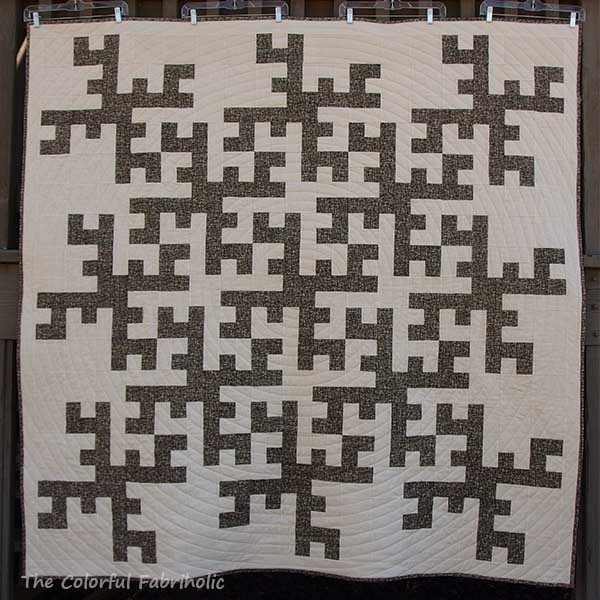 I will quilt this one myself with vertical organic wavy lines. We finally had a day without rain, ice, drizzle, fog, or single-digit temperatures, and there was even a brief glimpse of the sun. I dropped everything else and managed to get a few outdoor photos. Murphy helped. 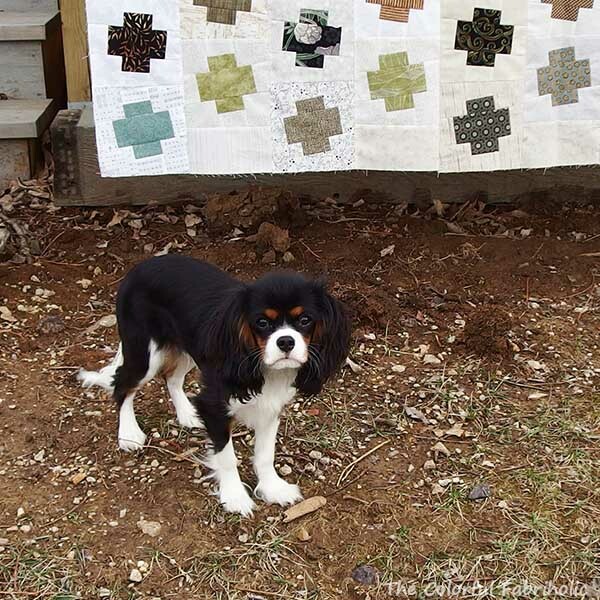 A six month old puppy is lots of help with a flapping quilt, especially when his feet are muddy. Fortunately no mud got on the quilts. My pants, however... well, you can imagine. We're still working on not jumping up on people. Murphy, 6 months, 10 lbs. Since I had only an indoor photo of my LCT QOV, I took outdoor photos of it as well. I need to add a proper QOV label to it and then it can be donated to QOV for an event in April. 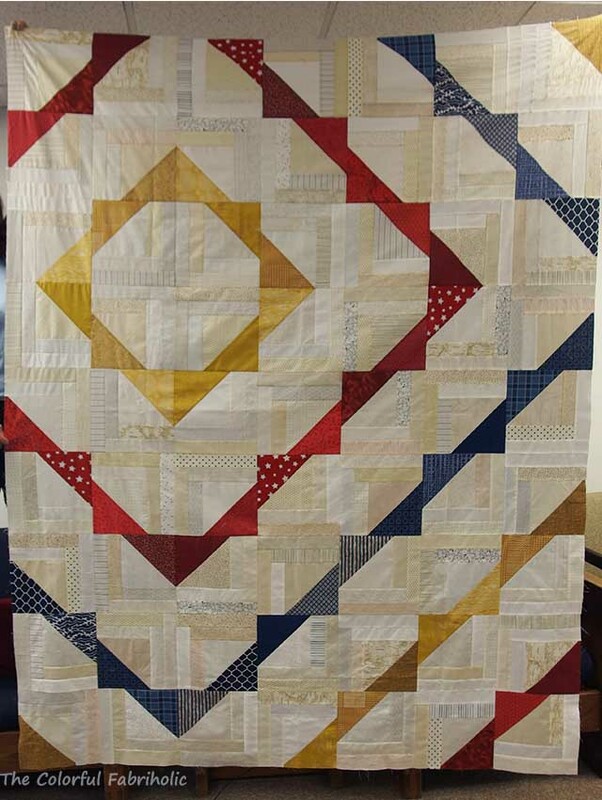 Log Cabin Triangles Quilt of Valor, about 62 x 80"
2017 is starting off well. My stash report will look pretty good this week! There's something about the new year that gets the creative juices flowing. Or maybe I just get distracted easily by intriguing ideas. Yeah, that's more like it. So far this month I've started the Pat Sloan Solstice challenge. I'm using a palette that's not "me." Because I believe repetition can contribute to a better design, especially in a sampler quilt, I'm making 6" Shoo Fly blocks using the fabrics from the main blocks. I don't know how this will end up, but I'll keep going for awhile. 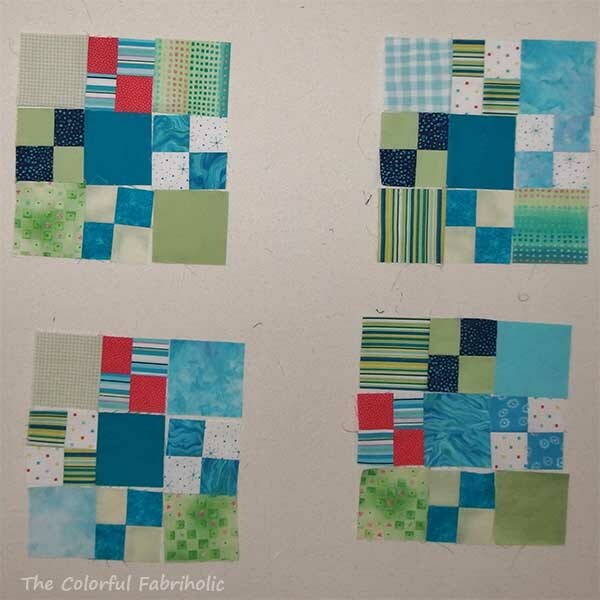 Here are my first four blocks and their companion Shoo Fly blocks. Last week I was distracted by my friend Karen's project and I just had to make her some little string blocks. Glad I tried them; learned they're not for me. My friend Cherie, who blogs over at the Quilted Jonquil, posted a couple of inspiring photos last week. Check out this post, scroll down and look for the antique top in the shop window, and the blue four patch top. Go visit, then come back. The antique top we saw in Paducah last spring was sold, but it's an interesting design. I played in EQ and recreated the block for her, and printed out templates so she can make her own version if she wants. Sure would look good using recycled shirtings, her specialty. And that four patch top in her post? 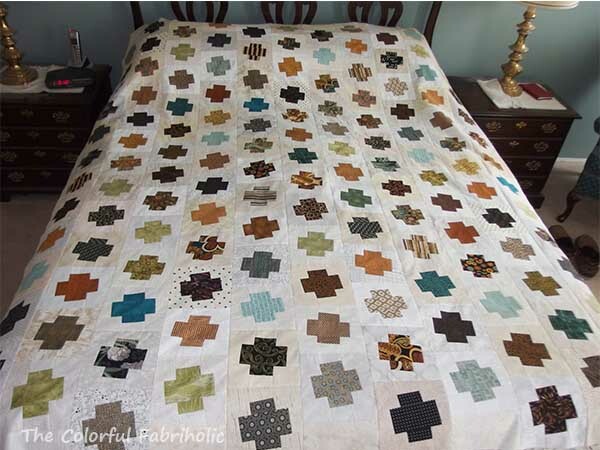 That was made using leftover blocks I had donated to a guild fabric swap several years ago. I ended up getting more of those blocks back in our guild's recent Orphan Adoption Event. Cherie has challenged me to finish a quilt with them and she'll finish hers so we can show them at show & tell at the same time. So I'm playing with them on the design wall. There's a reason these are leftover-leftovers. There's less variety, therefore they're harder to work with. 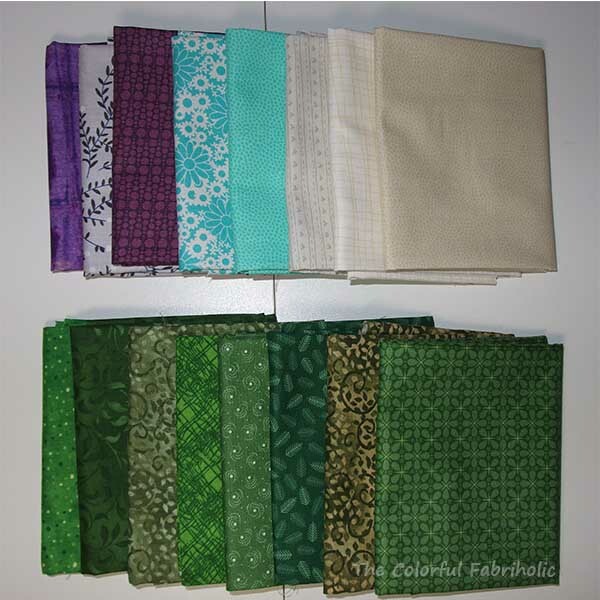 But I still have some of these fabrics in my stash, and I have a plan. Cherie only has to get hers quilted, and she has a long arm, but she works full time. 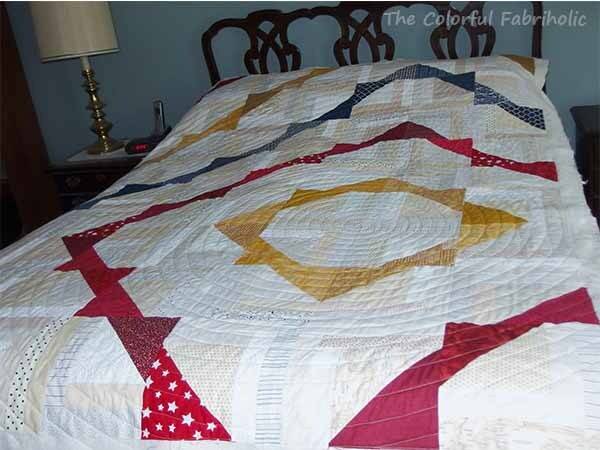 I have to make the top as well as quilt it on my domestic machine, but I have more time for sewing than she has. What do you think about our challenge? And, oh, by the way, Dancing Plus II is now a flimsy. The weather's been bad but I'm hoping to get some outdoor photos by Friday. Meanwhile, here's an indoor shot. It finished at 63-1/2 x 81-1/2". Enough distractions for one month? Oh, well, it's been nice having projects to keep me busy while the weather's been so bad. Between the the extreme cold, the ice storm, and the drizzly rain, I've been cooped up in the house for most of the month so far. Might as well play in the sewing room, right? So, have you been distracted by anything in the new year? My second Dancing Plus quilt is coming along. 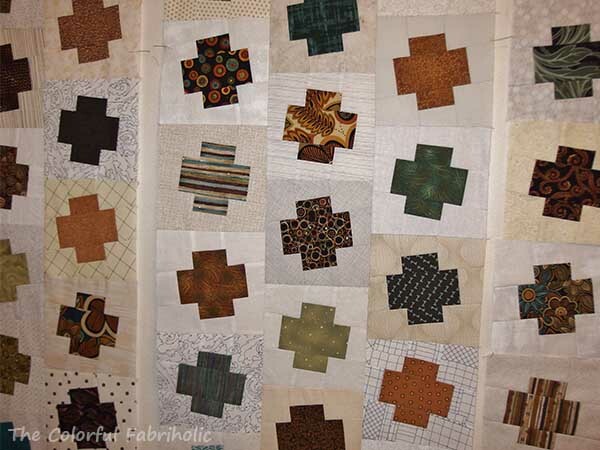 I spent some time in the sewing room during the recent ice storm and made good progress. 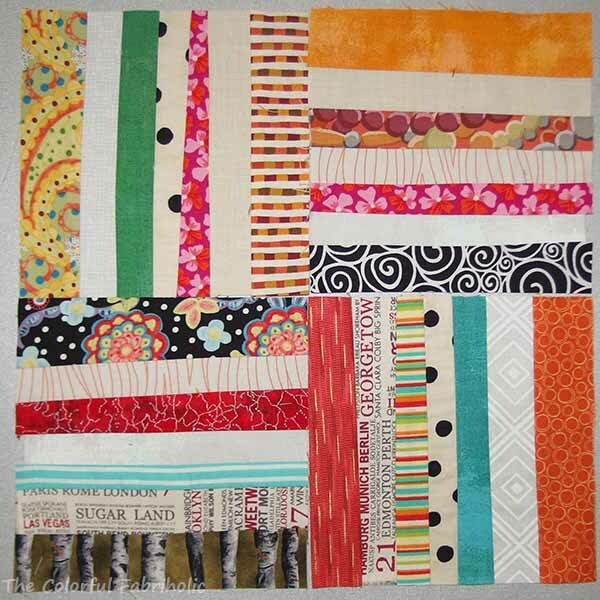 The first four columns are sewn together into a panel. The middle three columns are also joined into a panel. 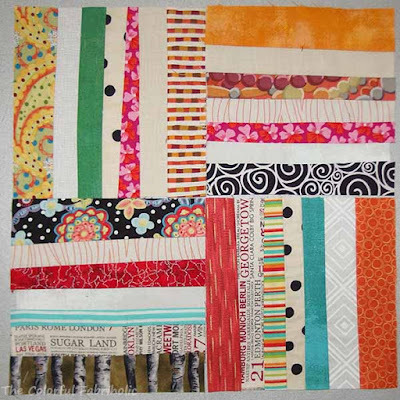 The rest of the blocks are still just placed on the wall, ready to be sewn into columns. I'm hoping to get this to the finished flimsy stage this week. Modern? Not modern? Doesn't matter. I'm still loving this palette. If I remembered to count every time I cut, there are 52 different light background fabrics and 57 dark plus fabrics. I don't have a purpose for this quilt, but this one may have to be a keeper. It just feels right to me. Have you ever felt like that, when you were making a quilt and the colors and pattern just felt totally "you?" One of the local quilt shops had a Fat Quarter Frenzy event, all FQs $1 each. I couldn't resist; 16 FQs came home with me. The purples are for my Pat Sloan Solstice Challenge project. The aquas and low volumes are purely stash enhancement. 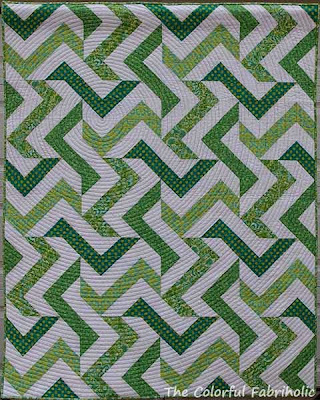 The greens are for a project requested by my son for next Christmas. Since I finished my LCT QOV, I can count out the backing (3-3/4 yards) and binding (5/8) yards. Since my objective for the year is to break even or have a net stash reduction, this is a fine start. 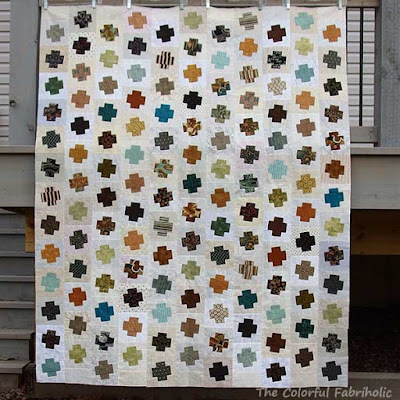 Linking up with Judy at Patchwork Times - check out everyone else's beginning of the year stash management efforts over there. 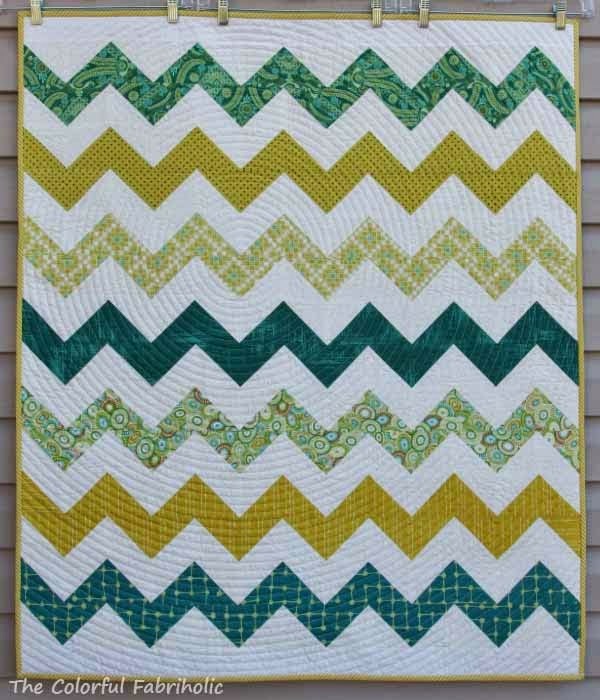 My Log Cabin Triangles QOV is finished, quilted, bound, and labeled. Appologies for the indoor photos; we're having bad weather. I hope to get some better outdoor photos next week. 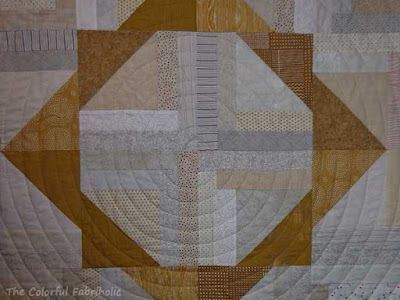 Here's the center of the spiral quilting, which wasn't finished yet when I posted the spiral quilting tutorial last week. 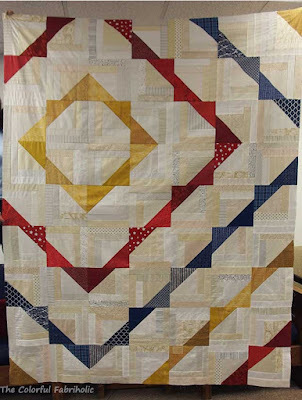 A local friend is collecting Quilts of Valor for an event in St Louis in April. 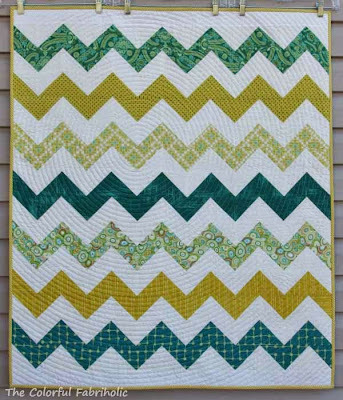 I'll give this quilt to her so she can include it in their event. I'll have opportunities to show it at a couple of local guild meetings first. After quilting it measures about 62 x 80 inches. Today I'll print out the label and prep the binding, and hopefully tomorrow I'll get it bound and photographed. Some friends get together for coffee after the First Saturday BOM meeting at our LQS. This time, Karen brought a new project and asked for advice. So for most of the morning Saturday, we played with Karen's concept, looked at her fabrics, offered ideas, and just generally had a great morning. Karen is participating in a newly formed bee at STLMQG and it's her turn to hand out the project this month. 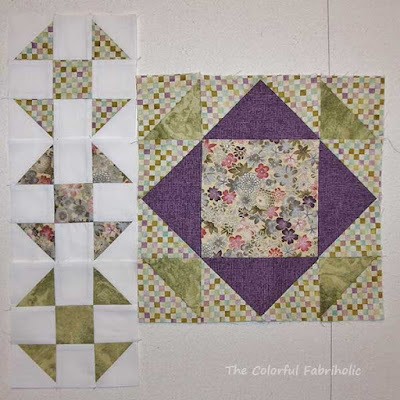 She chose string blocks a la Bonnie Hunter, and wanted guidance on how to present the project to her bee and what to ask of them. We offered advice and gave suggestions based on our experience with other bees. I couldn't resist raiding my scraps when I got home, and I made a set of string blocks. Karen, these are for you. They're trimmed to 6" and you can trim them down to the size you need. I'm passing along a few extra string scraps, too. It was fun to make one set, and I'm glad I tried out the concept. I definitely learned that a whole quilt made using strings is not for me. 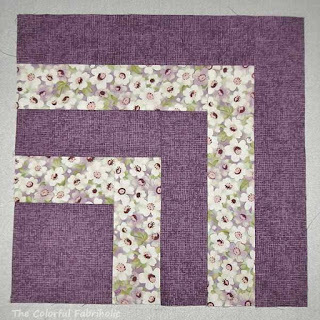 That's the beauty of bee blocks - you get to make one, or a few, without having to commit to an entire quilt. Karen, I'll pass the blocks and the scraps to you when I see you Saturday. Enjoy! I'm still working on the spiral quilting on the LCT QOV, so nothing new to show there. 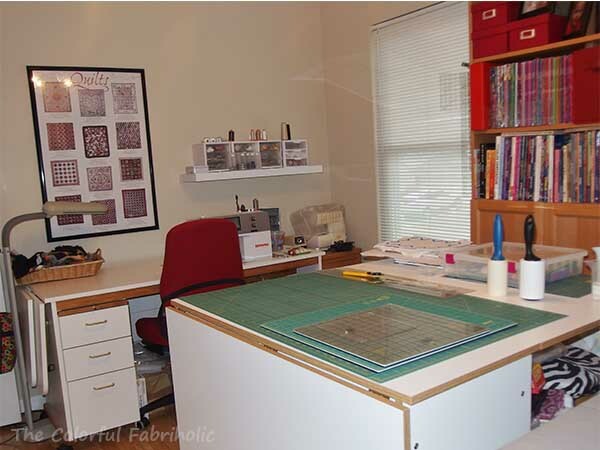 Other than that, I haven't had much time to spend in the sewing room this week. But I did take few minutes and make one block, Block 3 of Pat Sloan's Solstice Challenge. I wonder how this will come together. Will it look cohesive or will it just be a collection of random blocks? We'll see. Maybe I should limit the selection of prints and repeat a few of them in several blocks each. I think I have enough of that off white print to use it as a constant neutral throughout if I'm careful, and that also may help add continuity. It's too soon to tell where this is going yet. As a result of Monday's post, some of my readers asked me how I do spiral quilting, and asked me to reply on the blog for everyone's benefit, so here goes. Tutorial copyright 2017 Jan Ochterbeck; please do not pin without attribution. I quilt on a domestic machine, so all the advice I can give is only for a home sit-down machine. 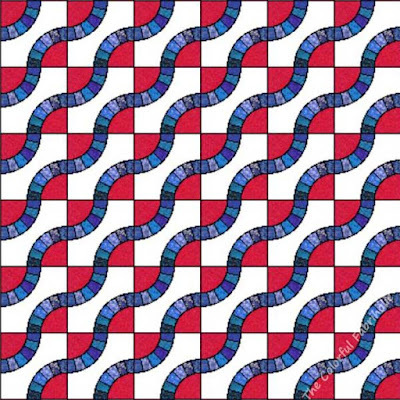 If you've never tried this before, I recommend starting with a baby quilt or a table topper first, before spiral quilting a twin size quilt. Use a walking foot, also known as an even-feed foot or dual-feed foot. Reduce the presser foot pressure as needed to work with your walking foot and the thickness of your quilt sandwich. Less pressure is better than too much. Insert a new needle. I'm using a Universal 80/12 but use what works well for you. Use the Needle Down option if you have it. 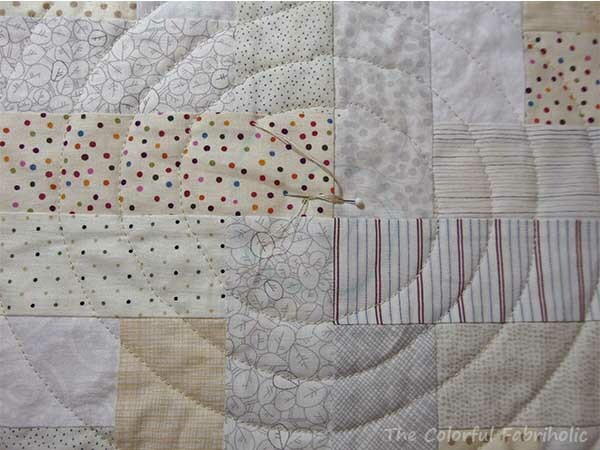 Otherwise, whenever you pause, always move your needle down into the quilt to keep the stitching as bobble-free as possible. I'm currently using 50 weight thread (large cone from Connecting Threads, no affiliation). I've also used 40 weight thread with good results. At the center of my spiral my stitch length was 2.5; as I got a few rows out from the center I increased it to my usual 3.0 for quilting. Guide is inserted upside down so it rides to the left of the needle. 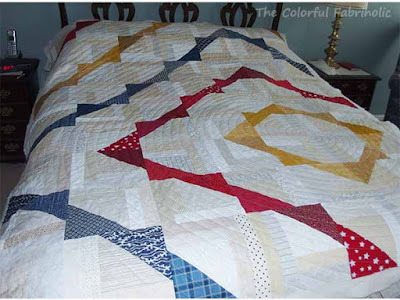 DO NOT baste around the edge of the quilt prior to quilting. Always sew clockwise. 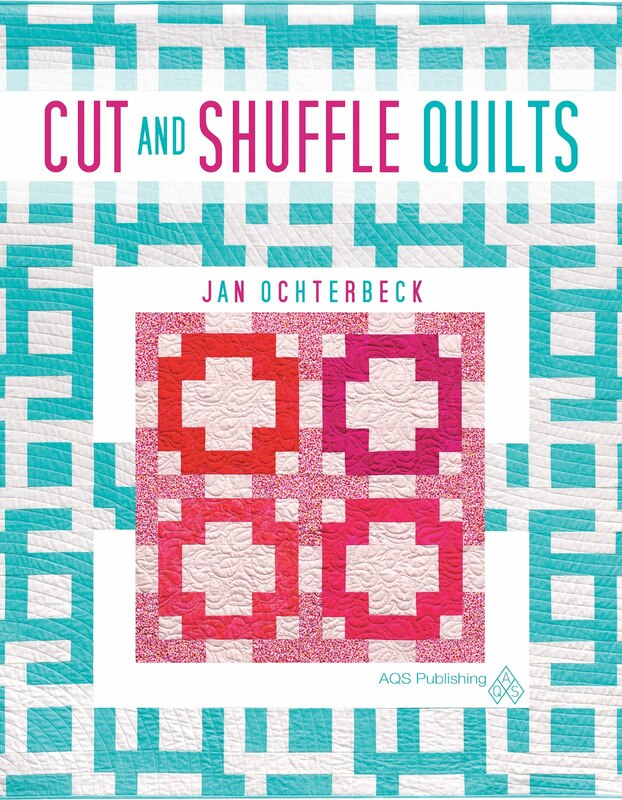 This will move your work closer to the edge of the quilt with each round, thus becoming easier as you go. Start near but a few rounds out from the center of the spiral. 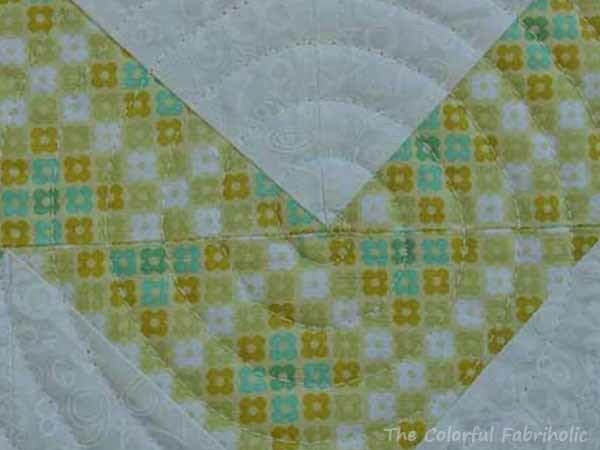 Align your guide on your markings and slowly and carefully stitch, keeping the guide aligned with your markings or on the previous line of stitching. Don't worry that the first couple of rounds are wobbly and not spaced evenly. They'll look awful. We'll fix this later. Just keep going around and around. As you complete a round, move the pins out to the next round, keeping the pins about 2" apart to minimize puckers and pleats. Let the machine feed do the work. 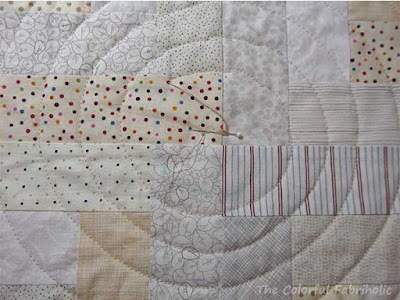 Do not push the quilt through; in fact, it's better to hold back a little on it to help avoid puckers. Don't worry about perfection. It's impossible. There will be some wobbly stitching and some puckers, for sure. When you get to the point where your stitching goes off the edge, this is a good time to check and replace the bobbin. If you started your spiral off-center, you'll get to one corner sooner than the others. 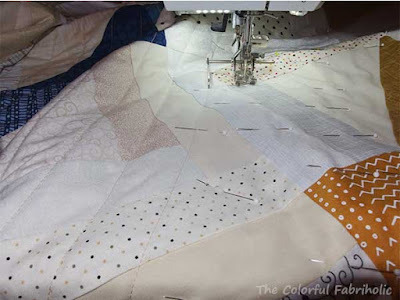 From here on out you'll be stitching partial rounds, and the going will get easier. 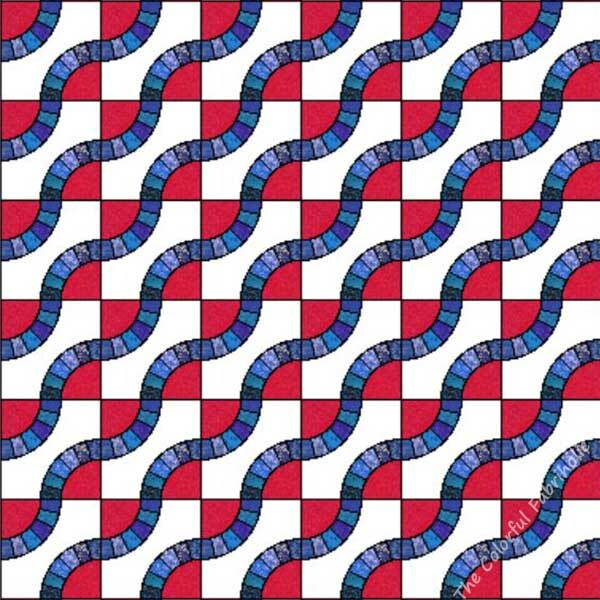 In the corners, just continue the arcs using the walking foot guide, repeating the arcs all the way out to the corner. Pause, spread the quilt flat, and move pins after each couple of rounds. 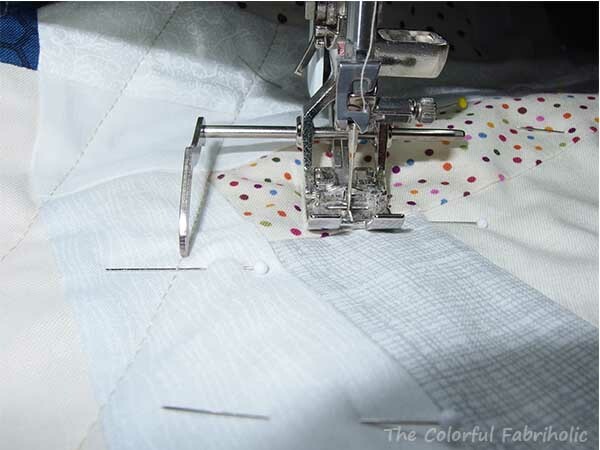 Keep pins spaced about 2" apart by moving pins from interior rows out to where you need them. Tip: As you're stitching around and around, keep your eyes focused on where the guide touches the previous line of stitching, not on the needle. 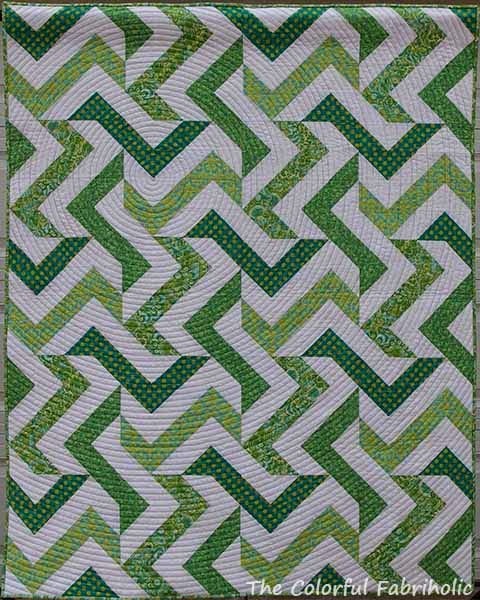 The closely spaced pins will help avoid puckers, and focusing on the guide line will help avoid wiggles in the current row of stitching. Make a template using an illustration app's spiral or using drafting circles. 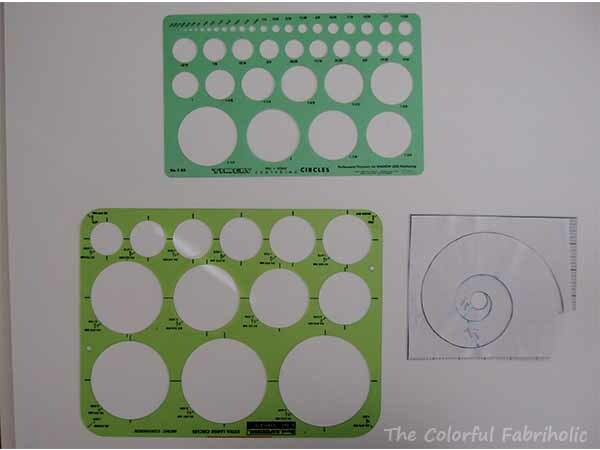 Print out on paper, glue it to template plastic, and cut along the spiral line. The first couple of rounds stitched with the walking foot will be very wobbly with bad spacing. Unpick them and bury the thread tails. 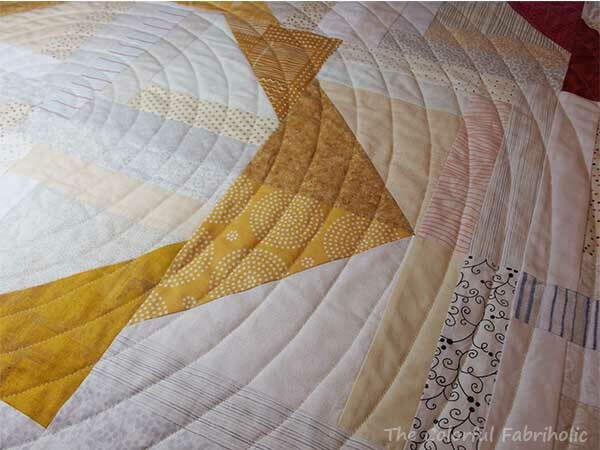 Reset your machine for free motion quilting. 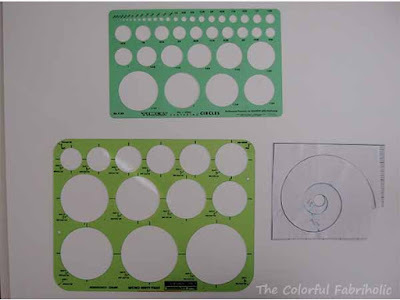 Add additional markings to your spiral center to evenly connect it to your stitching. Carefully FMQ the inner rounds starting from the end of your previous stitching and follow the markings to the center. I've done this very slowly, one or two stitches at a time, to get good results. with bad spacing, not unpicked yet. Before Christmas I started spiral quilting my LCT QOV. It's about 40% quilted now but I still have a lot to go. I want to finish this quilt - bound and labeled - this month so I can deliver it to my friend for the local QOV organization. 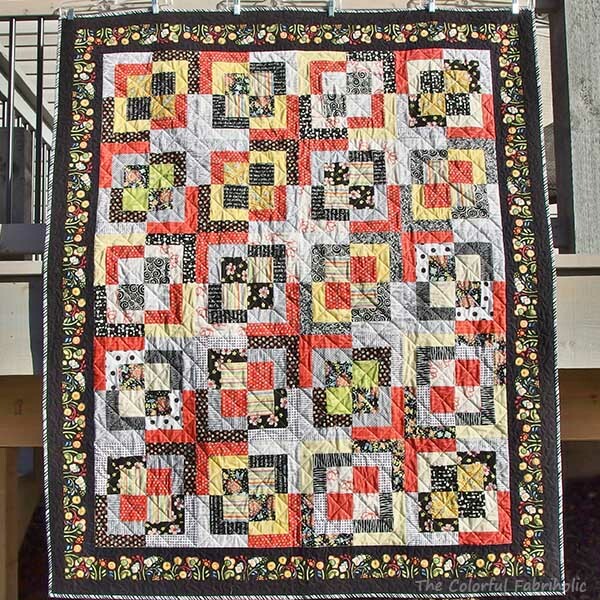 They've put out a call for 60+ quilts for a homecoming event in STL in the spring. 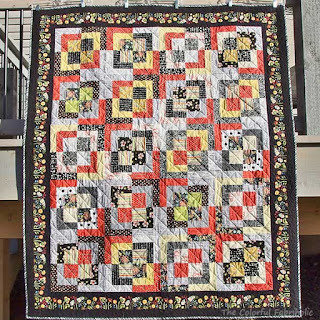 My friend's group and my guild are supplying 6 quilts and this will be one of them. My Dancing Plus II blocks are still on the wall and still not joined into rows. This was a December goal that didn't happen, so it's rolled over into a January goal. And I couldn't start a new year without starting a new project, right? 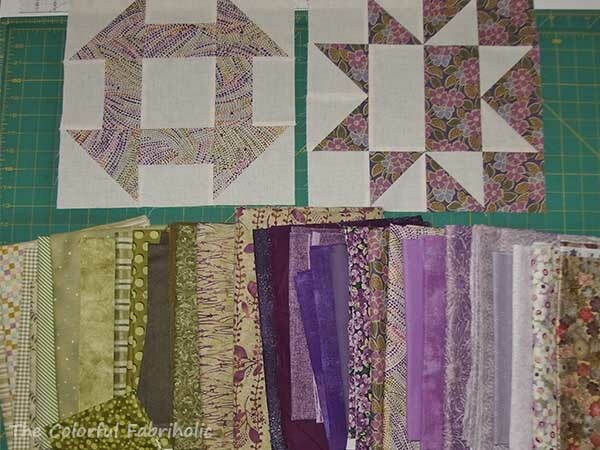 I think I might like to follow along with Pat Sloan's Solstice Challenge, 25 Blocks in 182 Days. This will be all from stash. Several years ago (8? 10?) I was collecting fabrics for a purple & olive quilt. With no particular design in mind, I never made it so the fabrics have been aging nicely. Maybe they can work for the Pat Sloan blocks. I have a constant neutral, and plenty of purples and greens. I hope we get some blocks with several levels of value so I can use lights, mediums and darks together. But before I can spend time in the sewing room, I have to spend time cleaning up and putting away the Christmas stuff. You can see gift wrap in one of the photos above! 2016 was a good year for stash usage, and for refreshing the stash. 2016 Net Change: 25-5/8 yards less in the stash than I started with. My goal for 2017 is to break even or reduce stash. 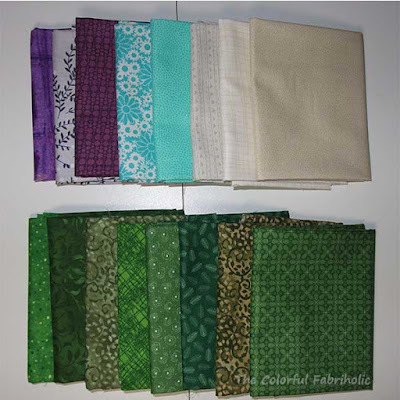 I'll continue linking up with Judy at Patchwork Times because these stash reports help keep me mindful of my fabric acquisitions. Since I've been logging my stash ins and outs, I haven't added as many prints just because I like something. When I do add, usually on sale, I focus on background neutrals, basics, backings if needed, and sometimes versatile prints. I give myself permission to add fabric at any time if it's needed to move a project forward or finish something. I've published my overall goals for 2017, but I'd like to briefly recap how I did in December and lay out the specific goals for January. 1. 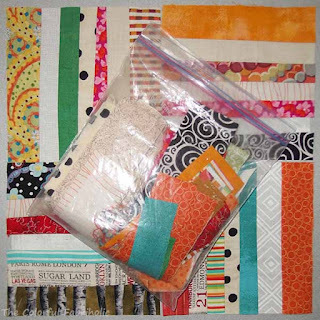 Layer & baste, quilt, bind and label the coral Bento Box quilt for a Christmas gift. Done & sent. Renamed Bohemian Bento Box from the border print. 3. Make progress on one WIP: Roman Road or LCT QOV. LCT QOV is in the process of being spiral quilted. It's about 40% done. 4. Inventory UFOs for 2017. Done: I currently have 8 UFOs and 7 WIPs. December was just too busy with Christmas preparations, and family & household stuff, so I didn't spend nearly as much time sewing as I did in November, and didn't accomplish nearly as much. But all Christmas gifts were done well in time, no last minute rush. 1. Complete LCT QOV. Contact local QOV rep about donation. 2. Assemble blocks for Dancing Plus II into a flimsy. 3. Make progress on at least one WIP or UFO. 4. Keep up with bee blocks. LCT QOV top. Quilt must be completed in January.